The Summit Middle School Program is designed to provide educational services to students in grades 4-8 who cannot be educated in a public school setting due to significant difficulties and challenges that may include behavioral disregulation and neurological and/or emotional impairment. The Summit staff participates in ongoing weekly clinical consultation with a child psychologist and Board Certified Behavior Analyst, as well as a child psychiatrist in order to develop individualized positive intervention plans for each student. A high staff to student ratio provides a safe, structured, predictable educational environment with outcomes that include students’ ability to generalize behavior in various environments, and improved self-confidence and coping skills. The program's experienced staff and standards-based curriculum can all lead to improved educational outcomes and transition to a less restrictive environment. Close communication with parents and other service providers, such as therapists and physicians, is an essential component of the program services and assists in the quality management of individual treatment plans. Parents may be asked to participate in clinical consultation meetings. Parents and districts can also request a meeting with the Program consultants. RELATED SERVICES: Students attending Summit may receive a variety of related services, including occupational therapy, speech & language therapy, physical therapy, as specified in their Individualized Education Programs (IEP). 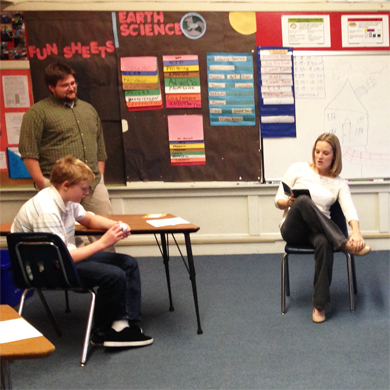 Students in the Summit program also have access to an onsite school adjustment counselor and school nurse.